Want to take control of your online marketing? 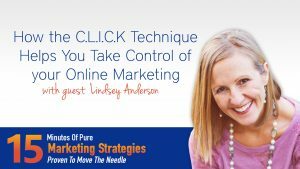 Then join me as I chat Lindsey Anderson of trafficandleads – where your solution to slow growth is just one click away – plus she’s my co-host on Marketing and Merlot and friend and now Best Selling Author of The CLICK Technique – which we’ll be chatting about today. So many entrepreneurs feel overwhelmed with online marketing – how does the Click Technique help? Tell us about the book and then step us through the Click Technique – what are all the steps? How do you peak curiosity for new leads? What happens after they land on your site – what are a few things you MUST do? Talk about the Irresistible offer. How does Facebook Advertising come into the equation? Why is mindset important in this process?